Americans are spoiled. Even the poorest among us are rich as compared to the rest of the world. We have many rights, privileges, and blessings here in the United States that the world would love to have. Many have died just trying to get here in order to participate in the opportunities that America provides. People take their material blessings for granted. They are generally content, but they don't have a clue as how to manage what they have. They think the good times are always going to be here, and they live their financial lives on the edge of disaster. They have never taken the time or energy to educate themselves on intelligent money management. People become greedy for more. Some become discontent with their current financial situation and want more and more. They hoard their money and become obsessed with making more of it. They can also waste it on a bunch of stuff they don't really need in order to impress people they don't even really like. be thankful. give thanks in all circumstances, for this is God's will for you in Christ Jesus (1 Thessalonians 5:18). be content. Keep your lives free from the love of money and be content with what you have... (Hebrews 13:5a). be faithful. Now it is required that those who have been given a trust must prove faithful (1 Corinthians 4:2). give back. Out of the most severe trial, their overflowing joy and extreme poverty welled up in rich generosity (2 Corinthians 8:2). share. And do not forget to do good and to share with others, for with such sacrifices God is pleased (Hebrews 13:16). do good works. And God is able to make all grace abound to you, so that in all things at all times, having all that you need, you will abound in every good work (2 Corinthians 9:8). love others. May the Lord make your love increase and overflow for each other and for everyone else, just as ours does for you (1 Thessalonians 3:12). be joyful. Yet he has not left himself without testimony: He has shown kindness by giving you rain from heaven and crops in their seasons; he provides you with plenty of food and fills your hearts with joy (Acts 14:17). save. he who gathers money little by little makes it grow (Proverbs 13:11b). gain financial wisdom. Of what use is money in the hand of a fool, since he has no desire to get wisdom? (Proverbs 17:16). Christians, let me ask you a question. During this Christmas season and the abundance that we enjoy, do you have the proper response to the Lord's material blessing in your life? Love the site. 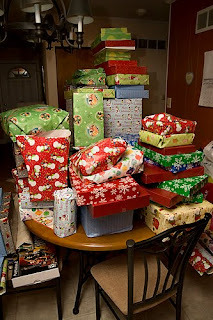 The past few Christmas's have been very rewarding as I haven't brought many gifts for people. I have been paying off debt which has pretty much forced me to find out what's important. My family still loves me the same and I can't ask for anything more than that! Hey, Divine. Thanks for leaving me a comment. Just checked out your blog - good stuff. Looks like your doing a great job of killing your debt. Keep up the great work!